We have committed to removing all 5p plastic bags from our shops by March 2019. We will also replace loose fruit and vegetable bags with a home compostable alternative by spring 2019. By doing this we will cut almost 134 million bags each year from the environment, which equates to 500 tonnes of plastic. We have also pledged not to sell any own-label products in black plastic packaging beyond 2019. And we are committed to making all own-label packaging widely recyclable, resuable or home compostable by 2023. These initiatives follow our announcement last year to remove coffee cups from our store, saving 52 million cups a year. And the good news is we're well on our way to achieving this target. More information and legislation details can be found at www.wales.gov.uk, www.gov.scot and on www.gov.uk. These pieces of legislation fit well alongside our wider work to promote the use of reusable bags and cut down on waste and litter. This is all part of our approach to Sustainability and includes: resuable bags available in store; the choice of bagless delivery for the majority of online orders; the option of delivery drivers taking used carrier bags away for recycling. We have committed to replacing loose fruit and vegetable plastic bags with a home compostable alternative by spring 2019 and removing 5p single use carrier bags by March next year in all our shops. We believe in doing everything we can to protect our environment and, while we know that we still need to do more, removing both 5p single use carrier bags and replacing loose fruit and vegetable plastic bags with a home compostable alternative is the right thing to do. How many bags will that save? It will save almost 134m bags a year, the equivalent of 500 tonnes of plastic a year. Why aren’t you getting rid of them immediately? We would of course be keen to deliver this much sooner, but these are significant changes for customers so we feel it’s important to get it right and be realistic about our delivery target. So do you plan to get rid of 10p bags eventually too? Not at this time, but we will continue to explore alternatives if they prove to be better for the environment in the long-term. Are your bags for life 100% recycled? Yes. 100% recycled content and recyclable. What reusable bags do you already sell and what are their cost? We already offer a range of reusable bags available in a variety of substrates including, cotton, juco and rPET (recycled plastic bottles), prices range from £1-£10. Why are you not introducing a paper bag? While paper may seem a good alternative, it can have its own environmental challenges, for example it can take three times more energy to make a paper bag than a plastic one. Will you still offer these bags on online orders through Waitrose.com? Online customers will receive home compostable bags for their loose fruit and vegetable by spring next year. The majority of our customers already select the bagless option, with a 40p flat charge for fully recyclable bags when they are required. We continue to explore packaging options with the goal of removing all carrier bags from our ecommerce operation. We all intend to take our reusable bags shopping, but sometimes they get left in the drawer or boot of the car. So we asked behaviour-change consultant Samantha-Louise Stallard for her top tips to help us remember them. And there's no better time to take note as our 5p single-use plastic bags will be phased out by March 2019. If you do not have your own bags, you will be offered the choice of a Bag for Life that costs 10p. You can choose to have your collection bagless or in carrier bags. If you choose to have a bagless collection, you will need to bring your own carrier bags to the branch. 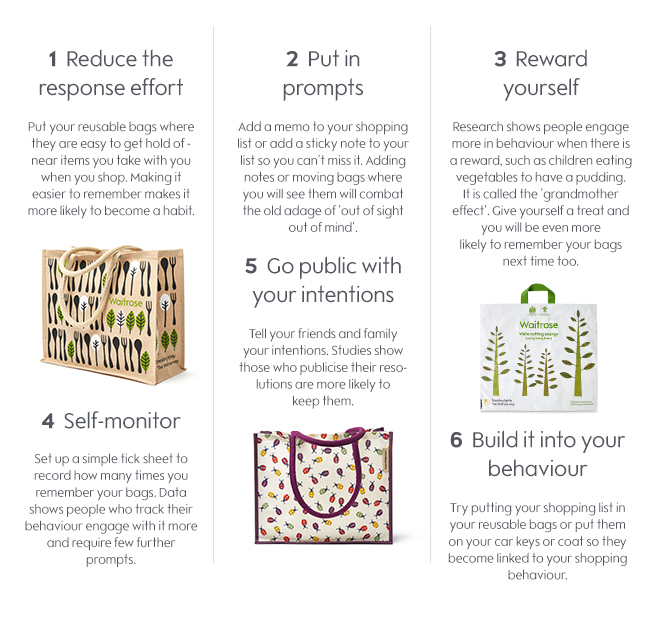 A Waitrose partner will then pack your order into your carrier bags. If you choose to have your collection already prepared in carrier bags, Waitrose will charge a flat fee of 30p. If you choose to have your delivery to be collected at any of our locker locations, Waitrose will charge a flat fee of 30p. We are currently unable to offer a bagless option for locker collections. You can have your order delivered in crates or in carrier bags. If delivered in crates, the driver will take them away once unpacked. If you choose to have your delivery in carrier bags, Waitrose will charge a flat rate of 40p per delivery. You can choose to have your shopping delivered bagless or you can purchase Waitrose carrier bags at checkouts. If you choose a bagless option your delivery will arrive in crates and the driver will take away the crates once the shopping has been unpacked. If you provide your own bags at the checkout then Waitrose will deliver your shopping in these bags. If you would like to purchase carrier bags at the checkouts the cashier will then charge 5p for each single use carrier bag requested.